Many HCMV proteins are dedicated to interfere with the host adaptive immune system. HCMV US11 reverse the translocation of human class I heavy chains from the host endoplasmic reticulum (ER) back to the cytosol which ultimately results in their degradation by the proteasome. US2 destroys two components of the MHC class II pathway, HLA-DR-alpha and DM-alpha, preventing recognition by CD4+ T cells. US3 prevents forward transport and maturation of all major histocompatibility complex (MHC) class I molecules by trapping them in the ER. HCMV US6 inhibits expression of MHC class I on the cell surface through TAP (specific transporters associated with antigen presentation) by blocking translocation of peptides from the proteasome into the ER for loading onto MHC class I. Viral inhibitor of caspase-8-induced apoptosis (from gene UL36) plays a role in the inhibition of apoptosis by interacting with the pro-domain of pro-caspase-8/CASP8 and thus preventing its activation . Another viral protein vMIA inhibits BAX- but not BAK- mediated apoptosis. The human cytomegalovirus protein TRS1 inhibits host autophagy process via its interaction with Beclin 1 . The conserved UL24 family of human alpha, beta and gamma herpesviruses induces a cell cycle arrest at G2/M transition through inactivation of the host cyclinB/cdc2 complex. HCMV encodes an UL24 homolog that should fullfill this role . 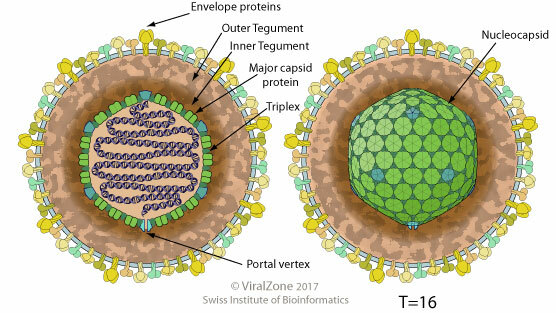 HCMV inhibits the cascade leading to production of interferon-beta by targeting host IRF3 protein with the viral pp65 protein . NK cells are a component of the innate immune system which play an important role in the early control of viral infections and also help to drive subsequent adaptive immunity. Several HCMV proteins are involved in the inhibition of NK-cells cytotoxicity including UL16 or UL142 that retain NKGCD2 ligands inside the cell to prevent their cell surface expression . HCMV UL69 modulates the host mRNA expression by exporting unspliced mRNA, thereby inducing alternative splicing .